I love girly stuff. I love the pinks, the pastels, the flowers, the feminine sweetness… It’s so much fun to buy little girl clothes and cute stuff, and there is so much cute FABRIC out there appropriate for little girls. And yet, nearly everyone I know has a little boy. Every time a friend or family member announces a pregnancy I cross my fingers, squeeze my eyes shut tight **andwish*andwish*andhope*andpray** that this one will be a girl. Then the ultrasound comes around, and another boy is announced. Don’t get me wrong, I love my nephews to tears, and spoil them whenever I get the chance–but one can only buy and make cute stuff for little boys for X amount of time before he pronounces it “for babies”! Typically, this happens by preschool time. The shelf life on cute stuff for girls is exponentially longer, and that is why I always hope for another little girl to spoil. 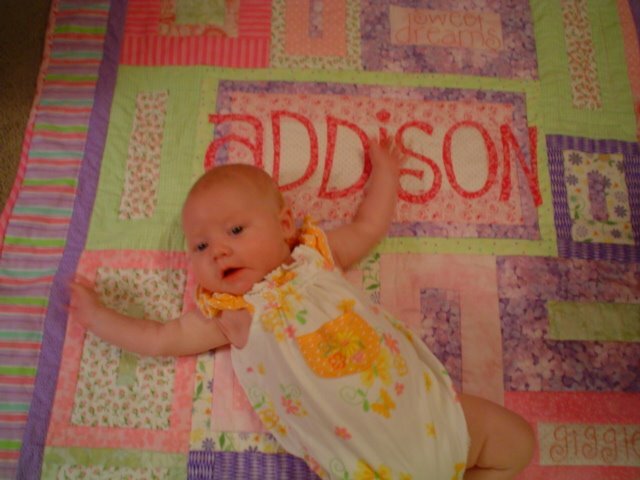 Okay, maybe she’s saying “I just had a nap and I feel great!” Either way, I’m sure she loves the quilt! 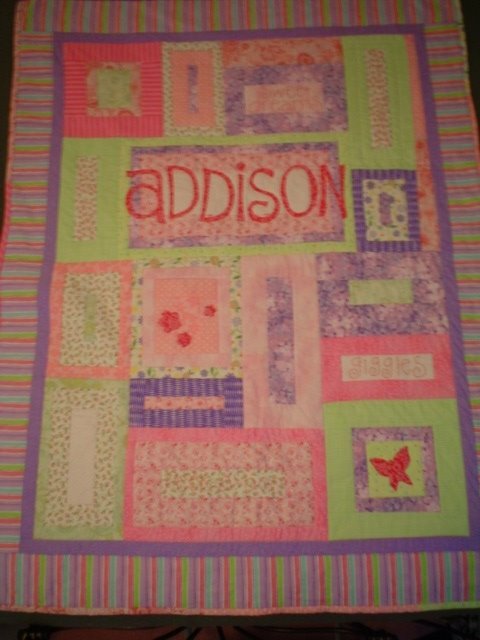 Cute (baby and quilt) …. I have four grandsons!! 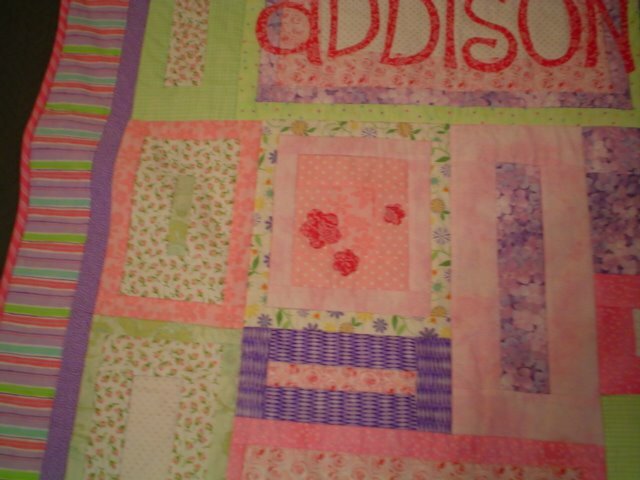 No pink in the quilts for them!! still haven’t given up on the grand daughter…but love my little boys to bits……!!! I love this…was it a pattern?…probably not, I know you don’t like them. Really my favorite part is the letters…how did you do them? Print on a computer first? As you saw this morning I long for girly stuff. This is so cute! 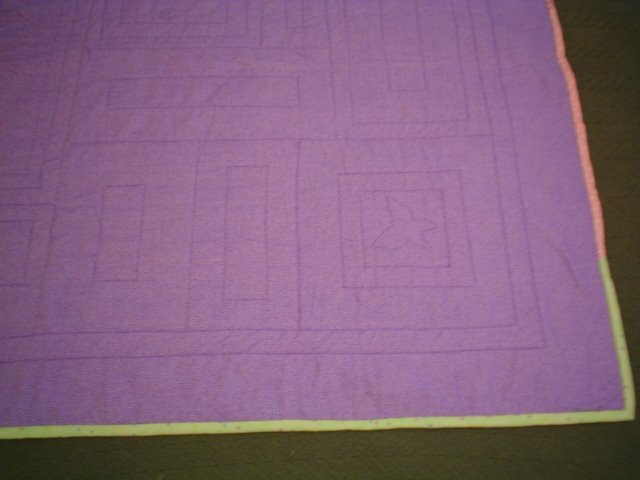 btw I didn’t just start quilting 6 months ago…i started again…i made my first quilt back in the late 80’s early 90’s, but then life, kids, being a mom and all those things took over. 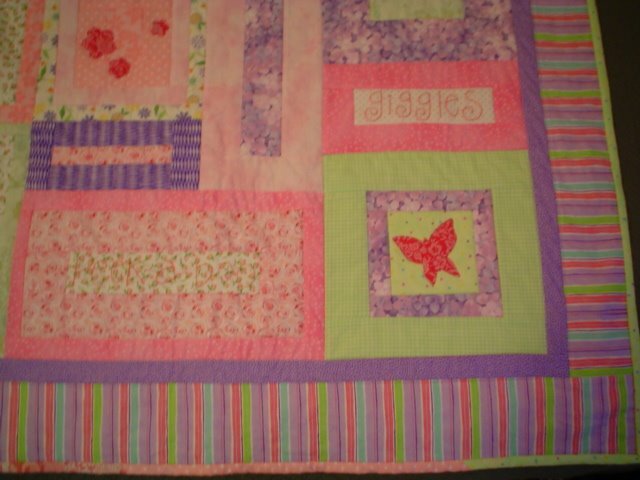 CUTE!Can’t wait to see what you’re working on at the next Quilter’s Cupboard Retreat!